As we well know, some Smug products subtly reveal their Smugness. Others display it prominently. Now Smug Scout knows there is a third possibility: strident evangelism. What is this craziness? 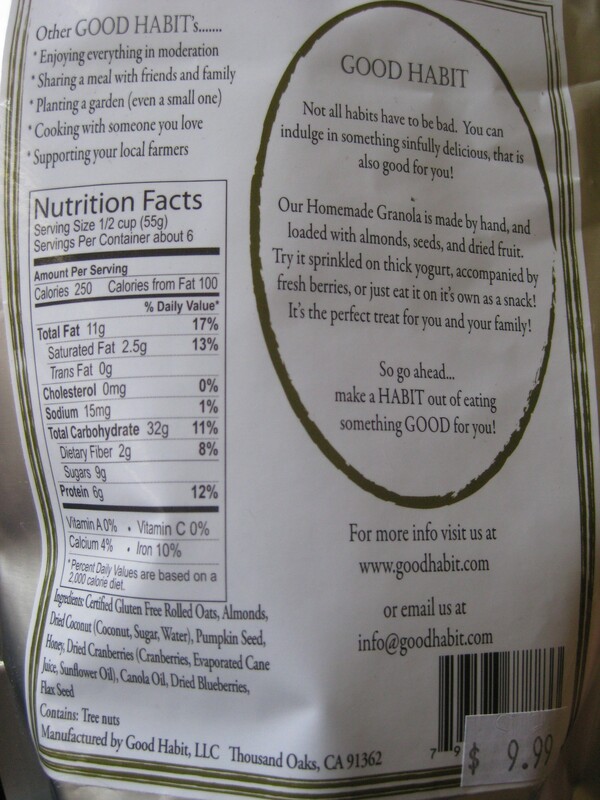 It all started when Smug Scout was on the prowl in the Silver Lake Cheese Shop, where she of course encountered a breathtakingly Smug local product: Good Habit Homemade Granola from Thousand Oaks, California, a suburb north of L.A. On the surface, this granola looked like your usual Smug granola: local, homemade, slickly packaged, and appropriately overpriced at $10. 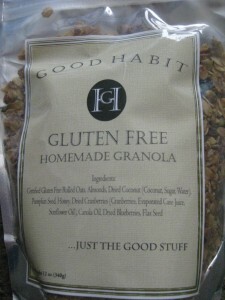 As she read the package, she gradually realized that she was dealing with the Joel Osteen of granola. Well, other than the disgracefully misplaced comma and apostrophe, Smug Scout can live with this one. She already eats Bircher Müsli every day, so consider her converted. Well, other than the disgracefully misplaced comma, Smug Scout is just baffled by this one. 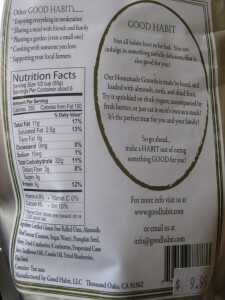 She does not know what “sin” something as virtuous as local, vegan, gluten-free granola could possibly be committing. At worst this is like a nun who gets overexcited by her measly sip of communion wine. Frankly, when Smug Scout thinks of “sinfully delicious,” she imagines non-Smug indulgences, such as New York pizza from Totonno’s in Coney Island or deep dish pizza from Pequod’s in Chicago, of course washed down with many chalices of non-communion wine. Smug granola is much more likely to be part of a sober post-gorging penance. Well, Smug Scout has had just about enough of the excessive punctuating and mawkish sermonizing. Now she has her own set of demands for “Good Habit.” She doubts the company will want to read this list, but she wanted to have one ready just in case. Give Smug Scout a house. How can you, you proselytizing granola, expect her to have a garden–“even a small one”–when she lives in an apartment barely bigger than a medieval monk’s cell? Give Smug Scout a big kitchen in that house. Just so you know, she prefers European appliances and reclaimed wood for all surfaces. She would not reject Simon Pearce handblown glassware from Vermont. For that matter, get Smug Scout a gardener. Smug Scout likes the idea of growing unheard of heirloom vegetable varietals, but she is turned off by the yucky reality of kneeling in dirt, burning up in the sun, and most of all wearing Crocs. For God’s sake, learn how to punctuate. Smug Scout is starting to wonder if she would prefer a granola called Bad Habit. At least it would leave her alone. 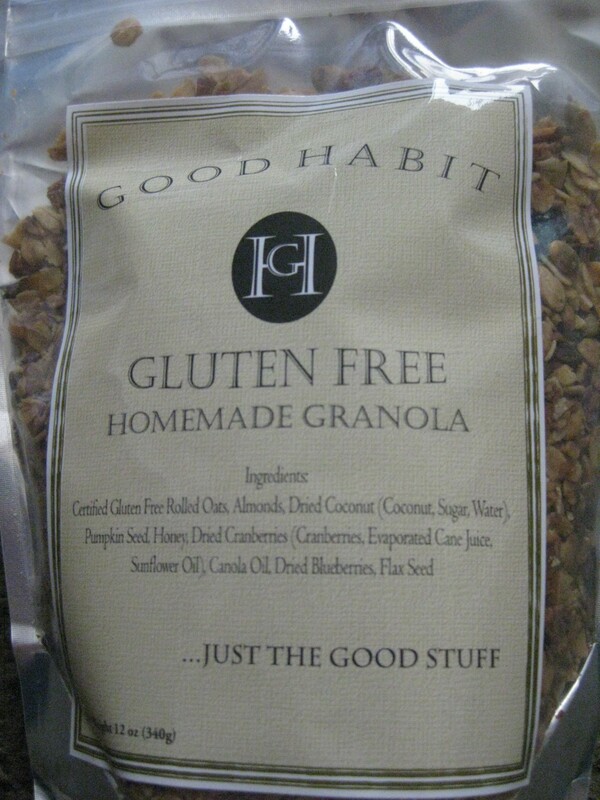 This entry was posted in Los Angeles, Product review and tagged good habit, granola, punctuation errors by Smug Scout. Bookmark the permalink.